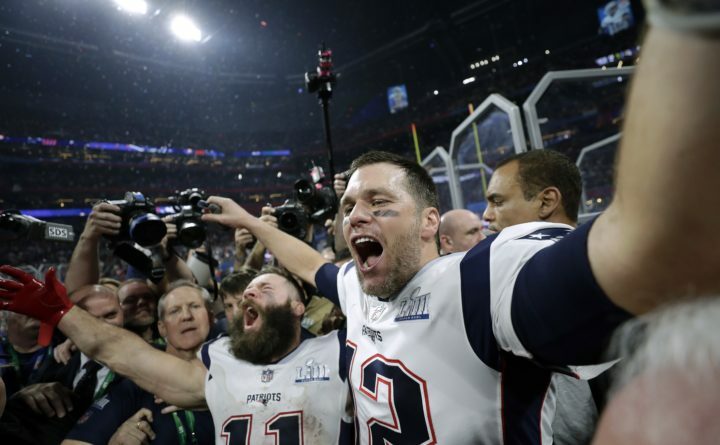 New England Patriots' Julian Edelman, left, and Tom Brady celebrate after the NFL Super Bowl 53 football game against the Los Angeles Rams on Sunday in Atlanta. The Patriots won 13-3. Edelman was named the Most Valuable Player. The NFL’s TV-ratings rebound did not extend to Sunday’s Super Bowl. According to numerous outlets, the game between the New England Patriots and Los Angeles Rams drew a 44.9 overnight rating, the lowest initial rating since the 2009 Super Bowl between the Steelers and Cardinals drew a 42.1 percent and a 5.2 percent drop from last year’s game between the Patriots and Eagles. That Steelers-Cardinals Super Bowl also was the last game not to draw at least 100 million overall television viewers, and Sunday’s game could dip below that mark as well. Last year’s game was watched by 103.4 million viewers, according to the final TV ratings. Ratings obviously were strong in Boston, which drew a 57.4 overnight rating (best for the Super Bowl since 2015), and Los Angeles (44.6, best in that market since 1996). But the Super Bowl’s overall ratings this year may have gotten dragged down by places such as New Orleans, home of a Saints team that many feel was robbed of a chance to play the Patriots because of a missed call in the NFC championship game. According to Mike Scott of Nola.com, the Super Bowl drew a 26.2 overnight rating in that market, a massive decline from the 53 rating the game drew last year in the Big Easy.